Will I Lose Weight Faster if I Cut Out Fruit? If you’re trying to lose weight with Paleo, one of the first pieces of advice you’ll probably get is “cut out fruit.” Depending on your weight-loss plan and goals, eliminating fruit may or may not be good advice. If you’re trying to get into ketosis, or if fruit just fuels your sugar cravings, then cutting it out may be a good plan. If you’re stuck in a plateau and the scale isn’t moving, it’s a reasonable experiment to try. But on the other hand, not everyone benefits from cutting it out, and there’s no point in restricting another food group if it doesn’t actually help you. 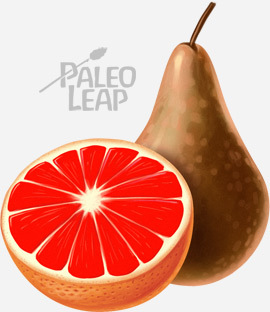 One argument from the very-low-carb corners of the Paleo world is that fruit just doesn’t play nicely with ketosis. Ketosis is a total metabolic switch from burning carbs to burning fat for energy. It can be very useful for weight loss, especially for people with a lot to lose. A truly ketogenic diet is around 80% fat by calories. That leaves about 20% for carbs and protein together, with a typical upper limit of around 50 grams of carbohydrate (depending on what you’re eating and how your particular body works, this could be lower). Just to put that into perspective, 1 apple or 1 banana contains about 31 grams of carbs. That looks like it might fit into a day of keto eating, but for some people even that might be too much. And even for people who can tolerate around 50 grams of carbohydrate without getting kicked out of ketosis, eating that fruit would severely limit their options for the rest of the day. In particular, it would be displacing vegetables, which are more nutritious for the amount of carbs they contain. Crowding vegetables off your plate to make room for fruit is rarely a good idea. If ketosis is your plan for weight loss, then fruit probably won’t fit into it, at least not very often. But ketosis isn’t the only way to make Paleo weight loss happen. For some people, it’s the fastest and easiest way to drop the pounds fast, but other people just feel awful on such a low-carb diet, or they prefer more protein than works nicely with ketosis, or they actually do better with more carbs. Ketosis is one way to approach weight loss; it’s not the only way. Another argument is based in sugar cravings. Some people find that fruit just feeds their sugar cravings and makes them more likely to give in to other sugary treats. For this group, avoiding fruit actually helps kill the sugar cravings faster, and makes it more pleasant and easier to eat well in the long run. Other people find that satisfying a sugar craving with fruit is the perfect healthy solution to make it go away. For those people, keeping fruit in their diet is a great plan for long-term adherence. Nobody else can tell you which group you’re in, so this is really a question of individual psychology and personal preference. Another argument against fruit for weight loss is that even if you’re not aiming for ketosis, the carbohydrate in fruit is particularly bad for weight loss. The demon here is fructose, the simple carbohydrate that makes fruit taste “sweet” (as opposed to other carb-dense foods like potatoes, which taste “starchy”). Fructose is a simple carbohydrate, one of the building blocks of more complicated carbohydrates. 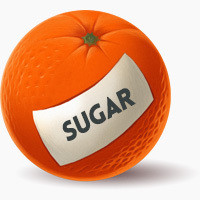 For example, table sugar (sucrose) is made of one molecule of fructose and one molecule of glucose stuck together. Fruit contains fructose as well as glucose, while other carb-dense foods like potatoes contain relatively little fructose. Fructose gets a lot of heat for being uniquely fattening, more so than glucose. But actually, it’s more complicated than that. Getting more than 25% of daily calories from fructose causes metabolic complications, but to get 25% of a typical diet from fructose, you’d have to eat 8 apples in a day, and even so, you’d be getting that fructose mixed with glucose, so it wouldn’t be the same as the rat studies anyway. The exception: it would be fairly easy to eat that much sugar from dried fruit. That’s why a lot of people do feel better leaving dried fruit out of their diet, even if they eat whole fruit. The researchers even discuss sodas specifically: the fructose in these drinks is associated with weight gain because it provides a lot of calories in a form that’s very easy to overeat, not because there’s something specifically bad with the fructose. You could get the same results with glucose-sweetened drinks, or drinks sweetened with table sugar (50% glucose and 50% fructose). The same goes for fructose and damage to the liver. Yes, it’s true that extremely high amounts of fructose can cause liver damage and fatty liver disease. But the evidence doesn’t point to the same effect for any amount that a typical person would get from eating fruit. It’s definitely true that some people have bad GI reactions to fruit. Some people have a FODMAP intolerance that prevents them from eating certain kinds of fruit; other people have fructose malabsorption issues. These problems can cause bloating, but bloating isn’t actually the same thing as fat gain, and it doesn’t “prove” that fruit is particularly fattening. Bad GI reactions to fruit can happen at any weight, and they’re a good reason to avoid fruit (as a general principle, avoiding foods that make you sick is a good idea), but they don’t make fruit “bad” for people who don’t have that reaction. So…Should I Cut Out Fruit for Weight Loss? Ultimately, it’s a question of individual reactions and personal choices. If your goal is ketosis specifically, eliminating or severely restricting fruit is probably necessary. Other than that, if you’re not happy with your weight loss or if you’re constantly having sugar cravings, cutting out fruit is one thing to try. It might or might not help, and unfortunately no study or list of macronutrients can really substitute for the evidence that comes from personal experimenting.